The Football Association of Wales founded in 1876 is the third oldest national Football Association. The 1876 Club has been established to promote the first class hospitality opportunities for all Wales matches. These packages will include the very best tickets with a quality hospitality package. We are offering packages in the 1876 Club Hospitality lounge for parties from two upwards and private suites for groups. All your tickets in the 1876 Club Hospitality will be in blocks and you will receive high quality hospitality and refreshments with two former international players present. Enjoy the luxury of your own Private Hospitality Box for you and your guests, with a pre-match meal, your own dedicated host, drinks service, and a seating area directly outside your glass-fronted box. Access is available from 2 hours before kick-off until 1 hour after the final whistle. Enjoy a hospitality experience when watching Wales play. 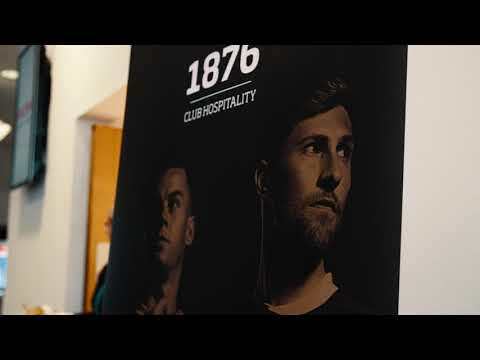 Soak up the atmosphere of the 1876 Club Hospitality Lounge, where you and your guests can enjoy pre-match entertainment and two course meal, premium match tickets on Level 3, and access to the 1876 Lounge bar. Access to a pay bar in the Ricoh Suite. A tab can be set up on the night or in advance. You can also pre order drinks to be waiting at your table when you arrive. Further details on this will be sent with your match tickets and itinerary for the game. *Smaller bookings may be on a shared table.